Junior Lindsey Smith and senior Maddi Butler dance during their performances to the excited fifth graders. City Lights' show this year is based on an office. As RBHS students dragged their legs into another day of school on Wednesday, Jan. 9, fifth graders eagerly filed into the Performing Arts Center (PAC) to attend the RBHS portion of the annual Fifth Grade Extravaganza. 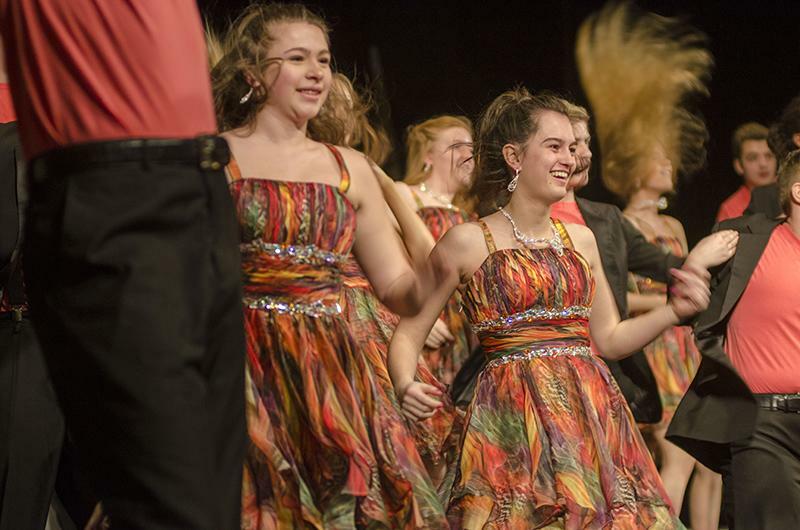 Future Bruins got to see performances from the RBHS City Lights show choir, Gentry Middle School (GMS) Glee Singers and Jefferson Middle School (JMS) Choir, said junior show choir member Greta McNamee. 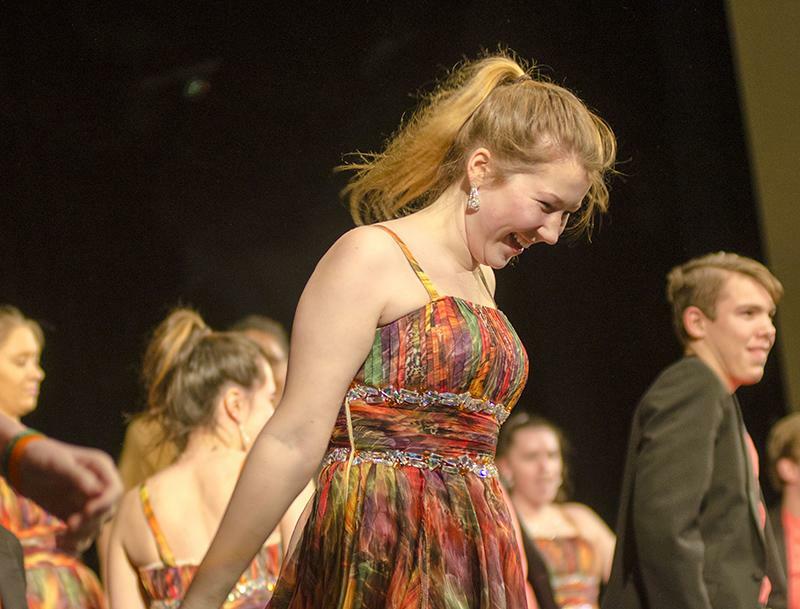 McNamee joined the RBHS show choir sophomore year, but wishes she would have known about the program before high school so she could have joined earlier. She hopes this extravaganza will show future Bruin singers what they have to look forward to. In addition to the extravaganza having an impact on the fifth graders, it was also important for the show choir to perform in front of an audience in preparation for its upcoming competition season. 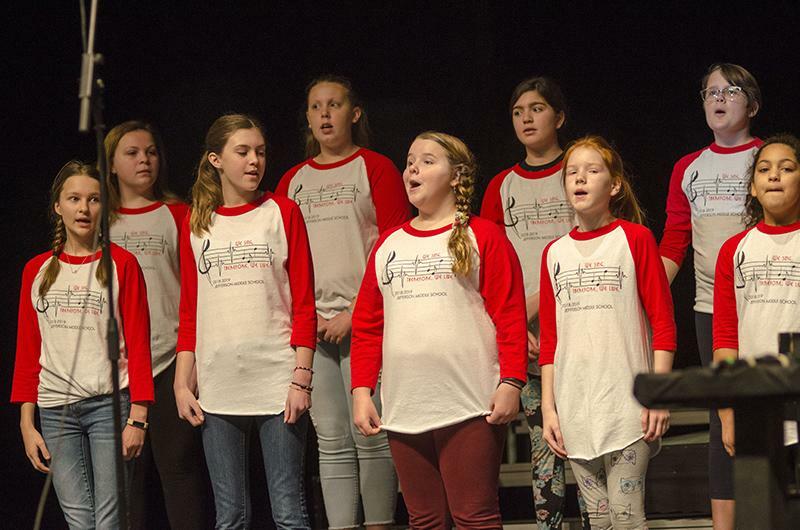 Jefferson Middle School (JMS) singers raise their voices in song in rehearsal for the fifth grade extravaganza. The JMS choir is a club that meets after school. JMS singers look back at the RBHS City Lights show choir as they make their way up the bleachers. 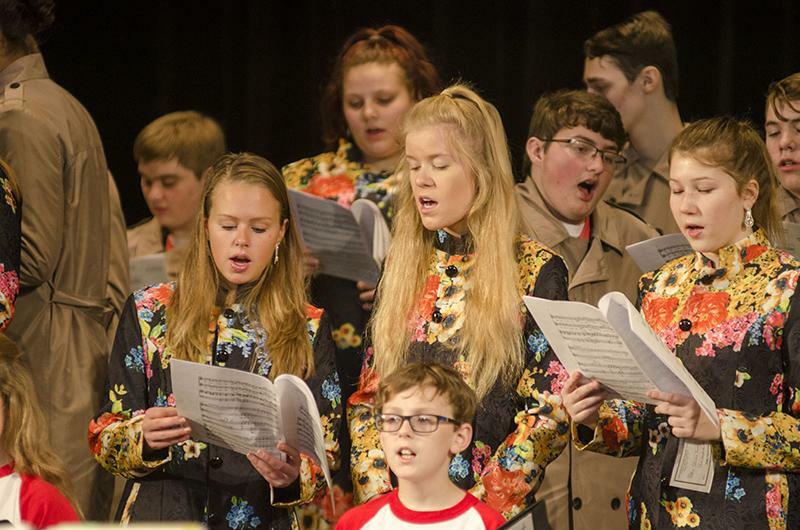 Many of the younger singers anticipate being a Bruin singer in the future. JMS choir teacher Christine Nichols leads JMS and RBHS in song. The two choirs sang two songs together before the fifth graders arrived. Juniors Mary Kate Grossman, Hannah Weber and Hope Keithahn read off a sheet of music with the middle schoolers. While the JMS singers practiced reading the music for weeks in advance, the RBHS show choir could sing loud after one read through. 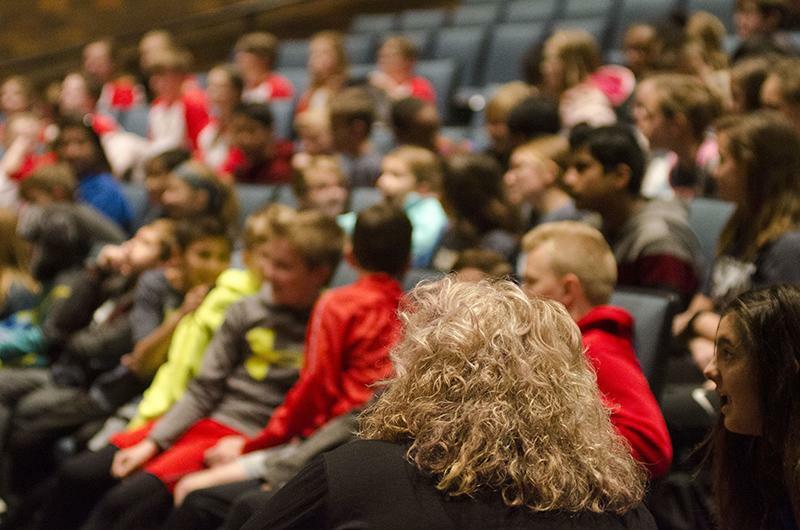 Gentry Middle School (GMS) music teacher Darla Lenz looks up at the stage with her students. 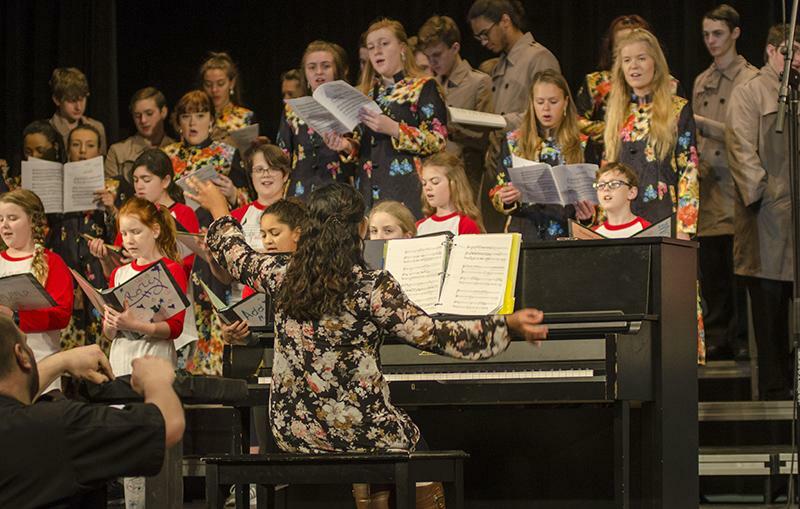 GMS and JMS, RBHS' two feeding middle schools, both brought choirs to the extravaganza. 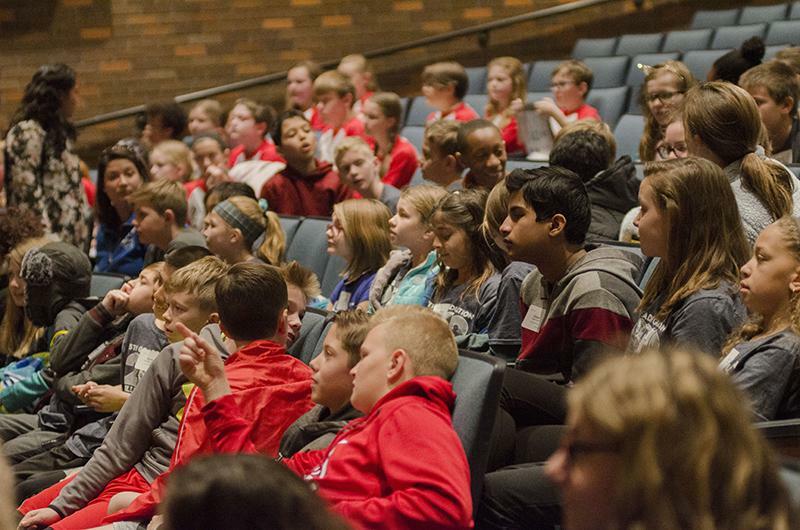 Fifth graders watch the stage in awe even before the performances began. The purpose of the extravaganza was to give fifth grade students exposure to the fine arts programs available to them at RBHS. Junior Hope Keithahn looks down with a smile as she prepares to whip her head up, letting her hair stand out in the front row. 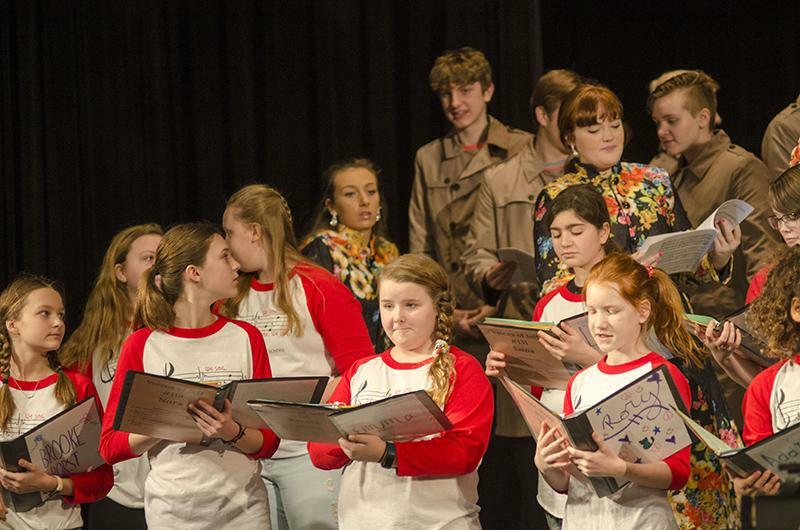 "It's always useful to perform in front of an audience," junior show choir member Greta McNamee said. "Especially gearing up to the beginning of competition season." Junior Allison Whittom extends her arms out as the final pose of City Lights' performance. The show is upbeat and exciting to any audience. 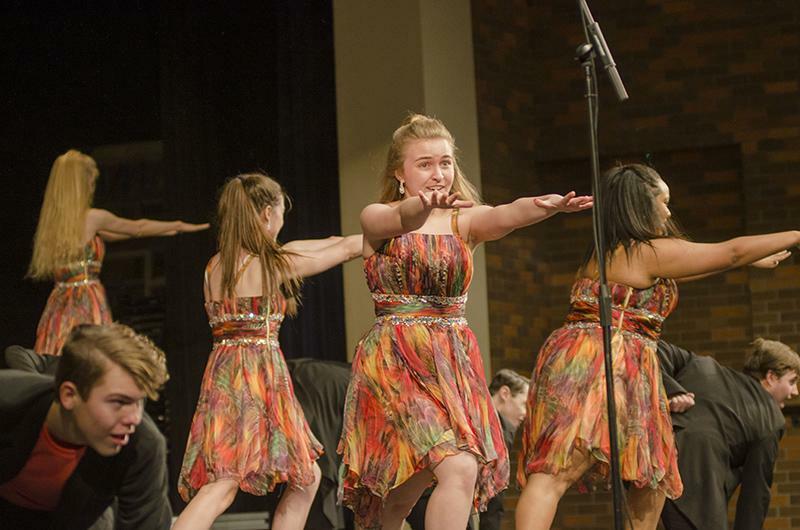 The show choir will kick off its competition season next Saturday, Jan. 19 in Pleasant Hill.